AzhwAr says in this pAsuram as to how engrossed he became with emperumAn, such that even the sensory perceptions became obedient. nenjE – Oh my heart! Whatever you may do, he [emperumAn] …. ERRAn – has always sustained. pugazhvAy pazhippAy – whether you praise or abuse emperumAn who is the object for the faculty of speech. pUndhuzhAyAnai – he is so beautiful adorning thuLasi garland that it is impossible not to praise him. igazhvAy karudhuvAy nenjE – Oh my heart! Haven’t you seen the status of emperumAn! Whether you think well or disparagingly of such a lowly entity (here the reference to emperumAn as lowly entity is mentioned in the opposite sense. In other words, he is a great entity), oh heart! don’t you know which of these is correct! thigazh nIrkkadalum malaiyum iruvisumbum kARRum udalum uyirum ERRAn – AzhwAr tells his mind that irrespective of whatever it does, there is none other than emperumAn to attain. thigazh nIrkkadalum malaiyum – by mentioning ocean and mountains AzhwAr is implying all the resultant entities. 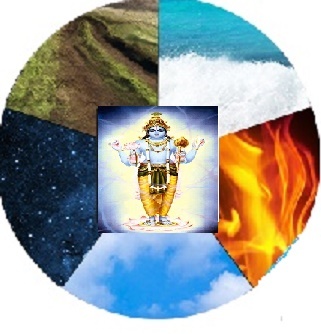 iruvisumbum kARRum – by mentioning sky (ether) and wind, AzhwAr is referring to all the five elements which are the causative factors. udalum uyirum – he is referring to the achith and chith (insentient and sentient entities) which are again, resultant entities. udalum uyirum ERRAn – emperumAn sustains all these. Thus, it is implied that all the entities mentioned above are emperumAn’s resultant possessions and he is the owner for all these. bruhadhAraNyaka upanishath 5-7-22 says “yasyAthmA SarIram yasya pruthivI SarIram” (for whom the jIvAthmA also is body, for whom the world is also body). Attain either emperumAn who is sustaining all the entities or sustain the entities which are being sustained by emperumAn. Even if one looks at the quality that he is the protector, isn’t he the entity to be attained! udalum uyirum ERRAn – isn’t he the entity who is implied by all these words! Let us take up the 74th pAsuram next. This entry was posted in iyaRpA, mudhal thiruvandhAdhi on August 22, 2017 by T N Krishnan.